Lucas St. Clair pitches his proposal for a 150,000-acre national park and recreational area at a Penobscot County Commissioners meeting on Tuesday, Aug. 9, 2014 in Bangor. 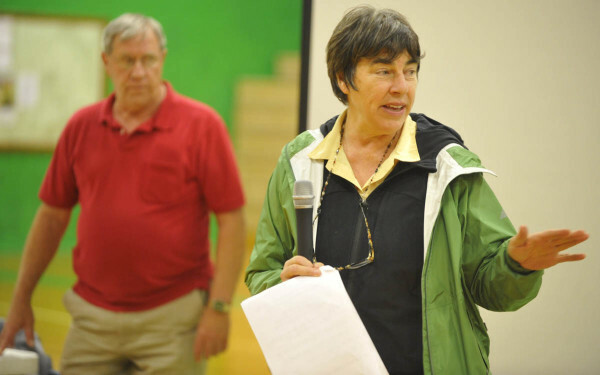 AUGUSTA, Maine — A coalition opposing a proposed 150,000-acre national park in the Katahdin region has asked leading park proponents Roxanne Quimby and her son, Lucas St. Clair, to give up on the idea and work with the group to find other ways to help the area’s economy. “We respectfully ask you to abandon your plans and apply your substantial land holdings and financial resources to more realistic and meaningful economic development in the region,” the letter coalition members sent to Quimby and St. Clair on Tuesday states. Anne Mitchell of the Maine Woods Coalition, Patrick Strauch of the Maine Forest Products Council, Bob Meyers of the Maine Snowmobile Association and David Trahan of the Sportsman’s Alliance of Maine signed the letter, which was released to the media Wednesday. David Farmer, spokesman for Quimby and St. Clair, said that despite the letter, there is no plan to end the park campaign. “We will continue to work to build support for the national park,” Farmer said Wednesday. “In the votes in East Millinocket and Medway, we actually believe we saw progress. We came up short in the election, but the support has only grown since last time,” he said, referring to Quimby’s unsuccessful bid in 2011 and 2012 to gain support for her proposal. East Millinocket residents voted 320-191 in a nonbinding vote on June 29 to reject the proposal. Medway voted 252-102 on June 23 against the idea, but the town’s Board of Selectmen maintained its endorsement of the plan after the vote. Millinocket Town Council members have said they oppose the park and so does their town. Tuesday’s letter rekindled arguments and criticism between those on both sides of the issue. “Well, sometimes big ideas are just plain bad ideas, and voters in Medway and E. Millinocket clearly understand that,” the letter states. Farmer countered, saying the statement ignores the Aroostook County towns of Patten and Sherman that would be at least as affected by the park as the Katahdin region. The campaign also commissioned a survey across the 2nd Congressional District in May that showed that 67 percent of 500 respondents favored the plan, he said. Patten officials say they plan to hold a public meeting on the park in September. Sherman officials said they have no plan to discuss the issue publicly. Farmer said he sees hope in East Millinocket. More people supported the park in the recent East Millinocket vote last month than in the 2011 vote against a study of the suitability of Quimby’s land for a park. The November 2011 vote was 513-132 against the study. The coalition’s letter offered no specific economic development proposals, an omission for which Farmer chided the group. 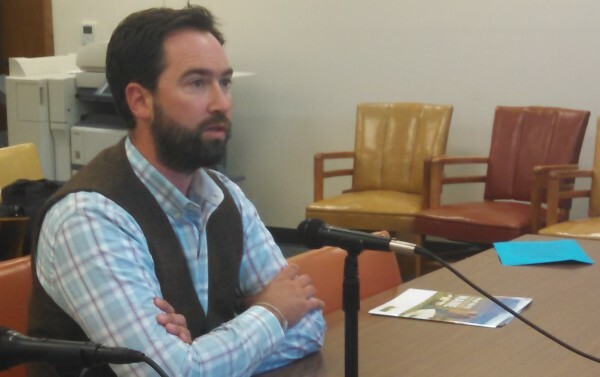 The coalition might be against the park and favor greater development of the state forest products industry, but the two are not mutually exclusive, Farmer said. Many national parks across the nation co-exist well with the forest products industry, he said. Farmer went on to say the forest products industry, state and local leaders apparently lack a plan to revitalize the Katahdin region’s economy or replace the approximately 450 high-paying jobs that began to vanish from the region when the first of its two paper mills, in Millinocket, closed in 2008. The East Millinocket mill was shuttered in 2014. “If they are aware of other investments to come into the region, we are more than glad to meet with them and talk about how those investments could work cooperatively with the park and recreation area. No one has approached us,” Farmer said. “The preference would be that they join other landowners in that area in allowing their lands be used for mixed [recreation and forest products industry] use. That’s been the model for years and years and it has served the state well,” O’Meara said. St. Clair proposes donating family land east of Baxter State Park to create a 75,000-acre national park and a same-sized multi-use recreation area as a gift to the nation. His proposal follows a similar plan Quimby offered in 2011. National park opponents have said they fear it would bring federal authority into Maine, cramp the state’s forest products industries with tighter air-quality restrictions, bring unwanted federal authority into northern Maine, generate only low-paying jobs and morph into a 3.2-million-acre park plan offered in the 1990s. They doubt the park would have the positive impact predicted and say the National Park Service has a huge maintenance backlog with its holdings. Proponents said a park could generate 400 to 1,000 jobs, be maintained by $40 million in private endowments, diversify a Katahdin region economy devastated by the closure of two paper mills and coexist with established industries. They say parks in several western states work well with surrounding foresters and that national parks have never in the service’s history been anything other than positive economic contributors to communities around them. The Quimby family continued to tout the 150,000-acre plan, despite owning about 88,000 acres within the two zones. This has caused some landowners within the zones to express discomfort or opposition to the plan. St. Clair has said the zones were merely limits drawn to reassure those who fear the park would become larger. Since the two towns’ votes, St. Clair has continued his practice of promoting his plan with one-on-one meetings around the state, Farmer said.